Nice, easy, and very forgettable. p. 185 -- Used 2lb mussels and halved all other ingredients, plenty to feed two of us with a nice baguette. I used extra garlic, lots of fresh parsley, dried basil and oregano, subbed dried thyme for mint, about 1/8tsp red pepper flakes (could have used more), omitted the green pepper, and added an extra hearty splash of wine as it didn't seem brothy enough to steam. Decent basic recipe for mussels, but not the Holy Grail. 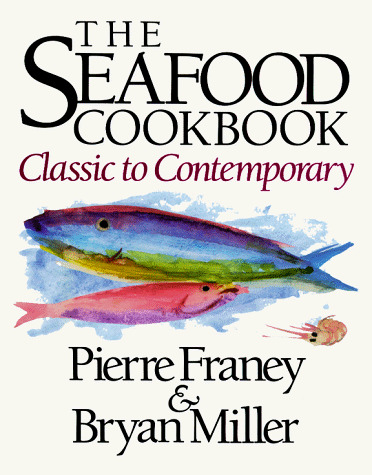 In this unique, essential cookbook, Pierre Franey, author of The 60-Minute Gourmet, goes beyond standard recipes to reinvent fish cooking for the eighties. In The Seafood Cookbook: Classic to Contemporary, master chef Franey and New York Times food critic and feature writer Bryan Miller have created more than three hundred original recipes that combine classic techniques, modern taste trends, and unrivaled convenience. The combination of Franey's skills and invention and Miller's knowledge of the current food scene as a professional critic have resulted in a book that melds the fundamentals of classic cuisine with the movement in America toward lighter, quickly prepared dishes. Every, aspect of The Seafood Cookbook reveals the authors' intention to remove the cloak of mystery that surrounds buying and preparing seafood. Chapters are organized by cooking techniques since any one technique can apply to a variety of fish. Each chapter -- on baking, sauteing, deep-frying, grilling, poaching, and braising -- offers recipes for commonly available fish in American markets. In keeping with Franey's 60-Minute Gourmet philosophy, 70 percent of these recipes can be made in an hour, a third of them can be made in thirty minutes. This lighter, faster, fresher approach carries over to the later chapters on sauces, stocks, vegetables, salads, and side dishes. From classics like Oyster Stew and Salmon Mousse to the best synthesis of French techniques and the new light cuisine -- deliciously realized in such dishes as Fillets of Flounder with Parsley and Mustard Sauce, and Carpaccio of Tuna with Ginger and Lime Dressing -- the recipes in The Seafood Cookbook are as quick and easy as they are innovative. The introductory chapters give clear instructions on how to buy and store the freshest fish and shellfish. One hundred and fourteen original line drawings beautifully illustrate the various species and basic techniques such as cleaning shrimp and squid and forming quenelles. The final chapter, offering a common-sense formula for pairing wine and seafood, is more helpful than any wine list. Once a food that intimidated many cooks, fish is now, thanks to Pierre Franey and Bryan Miller, faster and easier to prepare, and more delicious than ever before.